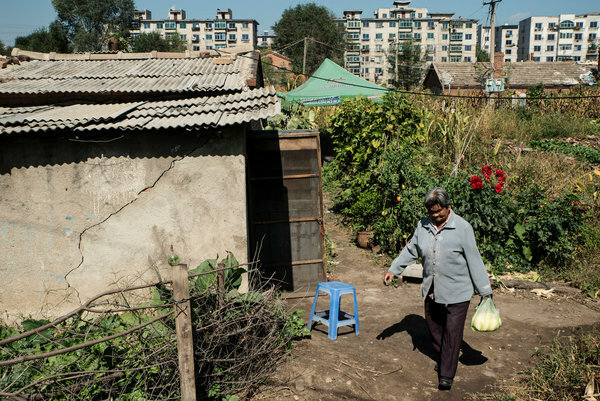 Coal, Which Built a Chinese City, now Threatens to Bury it. Originally published by New York Times on 06/10/15. FUSHUN, China — The descent into the pit was steep, and the car skidded down a bumpy serpentine road. “The road is supposed to be smooth, but last night’s storm and the following landslides make it so rough,” said Cui Yuan, 44, who as the head of the Fushun Geological and Environmental Monitoring Station is in charge of monitoring the landslides, which leave the road littered with coal byproduct. Toward the bottom of the pit, a decrepit four-story building slanted at a dangerous angle. Half of the tall, thin pillars supporting the conveyor belts that transport coal to the surface were tilted precariously. The few miners at Fushun’s West Open Mine, the largest open coal mine in Asia, were not mining coal but clearing roads blocked by landslides and putting out coal fires, which erupt spontaneously when buried coal is exposed to air for the first time in millions of years. The city of Fushun, one of many so-called coal capitals of China, is struggling. Two-thirds of its estimated 1.5 billion tons of coal has been mined, and today the mineral that helped turn the city into a booming metropolis of 2.2 million threatens to bury it. The coal mines here are winding down and shedding jobs. Decades of destructive mining techniques are causing frequent landslides that threaten to sink the city. As miners scrape out the last layers of minable coal, buildings near the mine have been abandoned and the city’s underground water pipes are cracking. Today, Fushun produces less than three million tons of coal a year, a drop from a peak of 18.3 million tons in 1962. All five main coal mines here could close by 2030, Mr. Cui said. Digging deeper would cause more landslides and more damage that the city is ill equipped to handle. When the Japanese occupied the region in the early 20th century, they refilled the pits as they mined to prevent landslides. The state-owned mining companies cut dangerously steep angles into the ground without refilling, a practice that has put Fushun’s future at risk, he said. Landslides now threaten 42.5 percent of Fushun’s urban areas, according to a 2012 government report. The city has begun refilling part of the West Open Mine with soil from another active mine, the East Open Mine, but it may come as too little too late. The damage already done at the West Open Mine is evident. Walking past a sign that warned “Geological Disaster Danger Zone: Do Not Enter,” Mr. Cui pointed to two empty, destroyed buildings about 70 feet below him. “Those sank a few years ago, and it sometimes sinks as many as 20 centimeters a day,” or about eight inches, he said. Just south of the mine, groups of bungalows are half immersed in water. Abandoned factories, shut down because of falling coal production and sinking ground, silently testify to the consequences of unsustainable development. 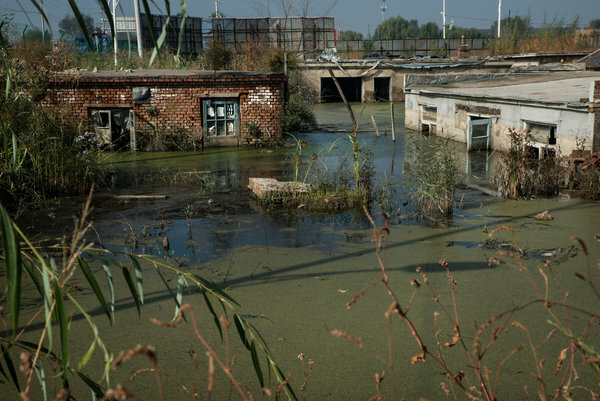 Also sinking is the city’s “vegetable basket,” once the city’s main farming area, some 13,000 acres of once-arable land. Now, 5,500 acres are completely useless, Mr. Zhang said. Rows of new apartment buildings have replaced the infamous Fushun shantytown, where miners and their families had lived for decades. One of several relocation projects, it had, by the end of 2014, taken in 413,300 former shantytown residents. But the displaced workers have other concerns. “We don’t receive much help finding new jobs, and the old factories don’t have funds to rebuild,” said one woman, who spoke on the condition of anonymity out of fear of reprisal. She had recently moved with her family, mostly factory workers, from a landslide zone to a new apartment. Although Fushun’s coal was discovered centuries ago, it was not exploited on a mass scale until 1901, during the Qing dynasty. Fushun was near the hometown of the early Qing emperors, and upsetting the land of royal ancestors was considered taboo. Japan joined the coal rush in 1903, first by renting land and then, in 1931, by seizing it. According to an exhibit at the Fushun Coal Mine Museum, Japan mined 223 million tons of coal here at the expense of nearly 300,000 casualties among Chinese miners before the end of World War II. “But it was the Japanese who laid the industrial foundation for Fushun, and Fushun became a city built around coal mines,” Mr. Zhang said. Later, under Communist rule, Fushun became a pillar of the Chinese economy, a leading center for not only coal but also the production of aluminum, steel and excavation machinery. Fushun’s decline began in the 1980s, when China’s economic liberalization drive no longer favored heavy industry. Now, mired in a chronic economic slowdown like much of the rest of the country’s industrial northeast, Fushun is grappling with the slow death of the coal mining industry. Mr. Zhang has helped draft plans to shift the city’s economy away from its dependence on coal and heavy industry, but progress has been limited because of the enormous costs, which the city can ill afford. In the long run, Fushun aims to become a consumption-based economy, he said, but given the wave of factory shutdowns, worsening job market, decreasing birthrate and declining population, that transition may not happen soon. Fortunately, besides fossil fuel, Fushun has 70 percent forest coverage and rich water resources. In recent years, the city has taken on infrastructure projects outside the industrial center and revived the landscape along the Hun River, which runs through the city.